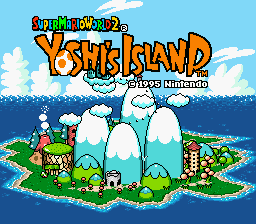 The English title suffers from squished-text syndrome, but it's no problem for Yoshi's trademark "egg-for-an-O". 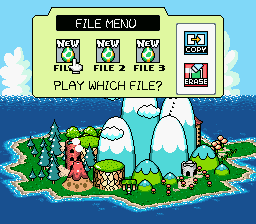 Probably due to limited space, the U.S. version names the files "File #" instead of keeping "Yoshi #" from the Japanese version. The "Extra" levels are called "Special" levels in the Japanese game. 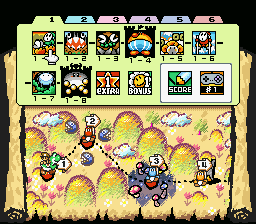 In the Japanese version, the bonus panel shows the name of the bonus game contained inside, which changes for each world. 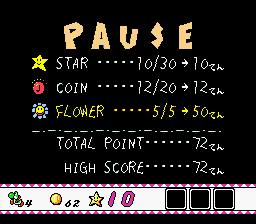 The U.S. version shows a flower icon and simply changes the number for each world. 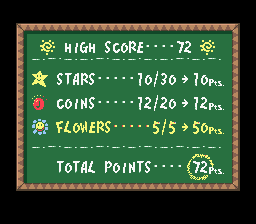 Though the score panel was redesigned, it has a blue pencil in both versions. On the control options panel, the button colors in the Japanese version match the colors on the Super Famicom (Japan's Super NES) controller. The buttons were changed to light and dark purple in the U.S. Despite the updated controller icon on the map screen (see above), the button colors on the control options screen were not changed. The letters on the buttons were bolded, however. 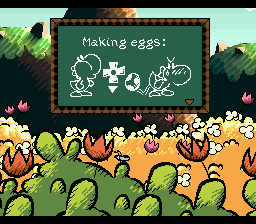 The first two message blocks in World 1-1 have illustrated help for making and throwing eggs. 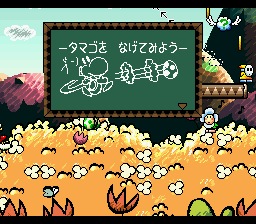 In both drawings, the Japanese version has onomatopoeia next to Yoshi. In the "Making eggs" tutorial, pon ("plop") is inside a word balloon. 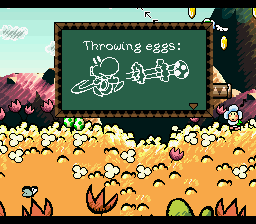 Bun ("boom") is next to Yoshi's head in the "Throwing eggs" tutorial. 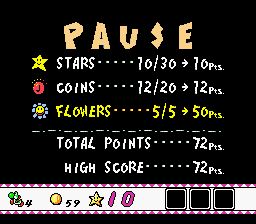 The U.S. version has bold text on the pause screen and end-of-level totals screen. Even the sun icons on the totals screen were thickened up. Thunder Lakitu is based on Raijin, the Japanese god of thunder. 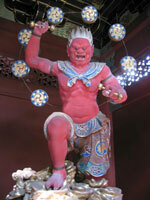 Raijin creates thunder by beating on his ring of drums, and is often depicted standing on a cloud. The following chart compares the Japanese and U.S. player's guides. * = This enemy was not listed in the Enemy Index section of the U.S. player's guide. The following enemies were not listed in the enemy section of the Japanese player's guide: Bouncing Bullet Bill, Bowling Goonie, Bubble Dayzee, Coin Bandit, Hopping Tap-Tap, Kamek's Toadies, Mock Up, Needlenose, Potted Spiked Fun Guy, Seedy Sally, Short Fuse, and Whirly Fly Guy. Most of the bosses in the Japanese game have "Big" added to the normal enemy name. "Borodō," Bandit's name, is a play on the word dorobō, which means "thief." Since "Sanbo" is usually called "Pokey" in English, the following enemies are technically Pokies: Blow Hard, Cactus Jack, and Spiked Fun Guy. Donburi (Burt) is also the name of a Japanese rice bowl dish. Wanwan (Chomp) is equivalent to "bow-wow." Yari, the Japanese word for "spear," is seen in the names of Yariho (Spear Guy) and Yariyari Dancer (Dancing Spear Guy). 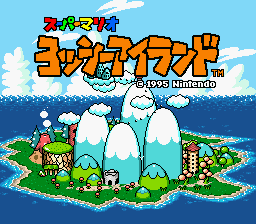 For the Flightless Goonies, the Japanese game uses "Ahōmushi," a portmanteau of albatross (ahōdori) and bug (mushi). Harry Hedgehog might have been named after the "Hari" in "Super Harimannen" (hari = "needle"). In Super Mario Bros. 2, the "Harimannen" enemy was "Porcupo" in English. Dosun, part of Incoming Chomp's Japanese name, is onomatopoeia for a "whomp" or "thump" sound. On a related note, "Dossun" is Thwomp's Japanese name. "Pukupuku," known as Flopsy Fish and Piscatory Pete in the U.S. version, is usually changed to "Cheep Cheep" for English text. The chū in Little Mouser and Little Skull Mouser's Japanese names represents a squeak sound. 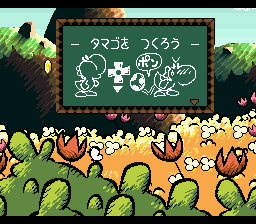 Based on his Japanese name, Mace Penguin is actually a Spike, who was first seen in Super Mario Bros. 3. If stomping on Mildes reminds you of popping bubble wrap, there's a good reason: The Japanese name for Milde is "Puchipuchi," which means bubble wrap. Gerogero (Prince Froggy) is equivalent to "ribbit ribbit." Raven's Japanese name "Kyū-chan" comes from kyūkanchō (hill myna), a species of myna bird. The Ravens' walking on spheres is a visual pun on kyū, which also means "sphere" in Japanese. "Kemekuji" (Sluggy) comes from the Japanese word for slug: Namekuji. Tap-Tap's Japanese name, "Kachikachi," also describes a ticking or knocking sound. Huffin Puffin: "Karugāmo" is from karugamo (spot-billed duck). 1-2 きょだいワンワンちゅうい Kyodai Wanwan Chūi Gigantic Wanwan Warning Watch Out Below! 2-3 つむじくんって　どんなあじ？ Tsumujikuntte Donna Aji? What's Tsumuji-kun Taste Like? What's Gusty Taste Like? Extra 2 いそげ！！ドキドキスイッチ Isoge!! Dokidoki Suitchi Hurry! Dokidoki Switch Hit That Switch!! 3-1 ようこそモンキーワールド Yōkoso Monkī Wārudo Welcome to Monkey World Welcome To Monkey World! 4-1 マリオでGO!GO! Mario de Go! Go! Go! Go! Mario GO! GO! MARIO!! 4-3 カウントゆかアスレチック Kaunto Yuka Asurechikku Count-Floor Athletic Don't Look Back! 5-1 ゆきの　かみなりジュゲム Yuki no Kaminari Jugemu Snow Thunder Jugem BLIZZARD!!! 5-5 あほーどりでアスレチック Ahōdori de Asurechikku Albatross Athletic Goonie Rides! 6-1 きょうふの　ほねあほーどり Kyōfu no Hone Ahōdori Scary Bone Albatrosses Scary Skeleton Goonies! 6-7 すごくハードなアスレチック Sugoku Hādo na Asurechikku Very Hard Athletic KEEP MOVING!!!! Chikuwa is a tube-shaped fish paste cake. The "Chikuwa floor" pieces are known as "Donut Lifts" in English. Special thanks: Jesse Chavez Jr., teh yoshi, J.J.